Easily crochet the edging into the fabric with the Sharp Crochet Hook! I got the fabric for this skirt from Sisters and Quilters. They have a wonderful assortment of fabric! 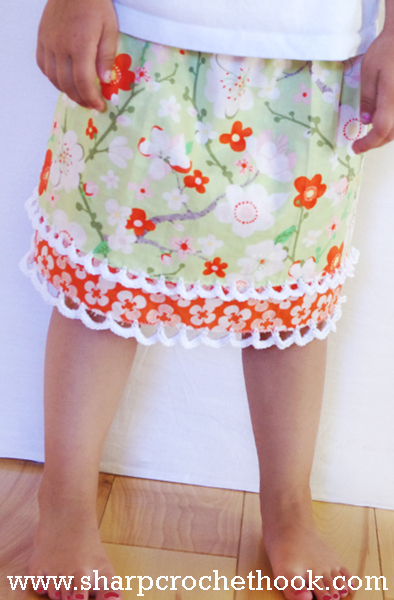 Step 1: Sew fabric into a simple skirt- sew into a tube (one seam) that will fit over hips, zig-zag stitch all raw edges. Roll the top 1” and straight sew around-leave an opening to insert 1/2” wide elastic for the waistband, zig-zag elastic ends. Step 2: With the fabric you want on the bottom, cut a 5” strip. Zig-zag stitch all around it. Sew to the bottom of top layer- leave a 1” seam allowance. R1: *Ch 5, sc into fabric with the Sharp Crochet Hook leaving a 1/2” space. * Repeat. R2: Do 6 sc into each ch 5 space. R1: *Ch 7, sc into fabric with the Sharp Crochet Hook leaving a 1” space. * Repeat. R2: Do 8 sc into each ch 7 space. Get your Sharp Crochet Hook and Sisters and Quilters fabric today! SO CUTE!! I am fairly new to crochet. I am exicted to see another wonderful thing to love about this craft. What a great tool!